OK, that didn't work and I cannot see important things! Tip: Map the “COMPRESSED” button to the user toolbar to instantly change sequence preferences. LAYOUT-EDIT LAYOUT: allows customizing of interface, but DS Can’t be used in this mode. Must relaunch application after changing. ADD/REMOVE PANELS—R-click on a line between panels. R-click on panel to add a split, remove a split, use the view switcher and set the view. No two panels can overlap. R-click on a panel border to remove the splitter bar. R-click on the toolbar to get a new toolbar. R-click / Customize / to add a specific system function. Control and Drag will duplicate a button. Customize Toolbars: Command and Control / Toolbars to add a menu button (for a pop up menu) or a specific preset button. can open at a time. Effects presets you create or from browsers. System functions or buttons. R-click Customize. CTL-drag buttons into toolbar. They can be re-ordered in the toolbar. CREATE MENU BUTTON—has a list of whatever under it. TOOLBAR GROUP LABEL—lets you label a group of buttons in a toolbar. Customizing the layout and customizing a toolbar are two things that have to be done separately. Create a toolbar -- call it "Tinder." Right-click in the toolbar and say "Customize"
Drag-and-drop a "Menu Button" to the toolbar. Name it. Drag-and-drop the effects individually to the Menu Button created in step 4. By a combination of splitting horizontally and vertically, create a space in the layout that will hold the newly created "Tinder" toolbar. Right click in that space, and assign the "Tinder" toolbar. That now embeds the toolbar you just created into the layout. Go in Program Files\Avid\DS_vx.x\Preferences. Rename the folder that has your login name. Restart DS. A brand new "user name" folder will be created with all default layouts you can modify to your liking. You can then make copies of your personalized "user" folder, so if someone else messes with them, you just replace the folder with a copy, renamed to the "user" login name. Uninstall DS, erase the DS_vx.x folder, reinstall DS and this problem should be resolved. 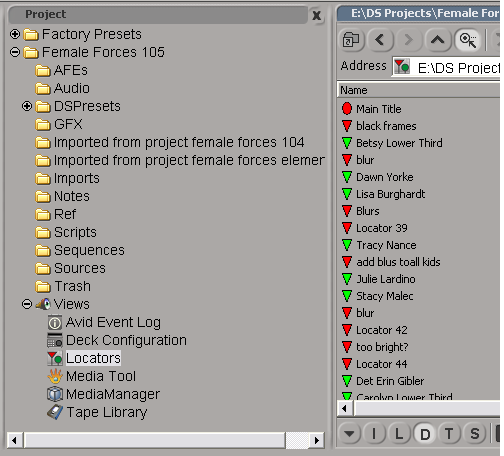 Go to Layout -> Import/Export Preferences. On the "Import" tab, select "Import" and browse to the file. Open the File, and Import it... that's it. The imported layout should appear as an additional layout in the bar on the top left of the left-hand monitor. Go to File > User Pref > General, use the "Update Default Window Size/Position"
Layouts are different when you open NTSC, versus PAL, versus 720 HD or even 1080 HD projects. If you browse in your Preferences folder and check your "user name" > Layouts folder, you will see all these options. These were created each time you create and opened a project matching the relevant video formats. If the layouts is mostly blank on one machine, try to rename your above "user name" folder and reopen DS to force it to create a new clean "user name" folder and layouts. If that works, your previous "user name" content is corrupted and should be discarded. If not that, check the Display Properties and verify the monitors screen sizes and alignment (maybe one of off? ), and even the bit-depth. Just one wrong value in there and the DS layouts can go blank. "Clamp to Video Levels" checked. Tinder's values. A simpler route might be to copy/paste the curves to a DVE node and then use that DVE's X and Y values in an expression to control the T_LensFlare X and Y. That way you can set the scaling as part of the expression. This is time-consuming, and all in all it's probably quicker to track it manually. Sapphire - S2_LensFlareAutoTrack will track an object as long as the highlight is obvious and doesn't get occluded. Use the Crop effect and set top/bottom to "60" and "61" respectively. Divide your matte by 2 and set your top and bottom crop accordingly. Open the Locators window (Views>Locators). Locators generated during capture cannot be permanently deleted. If you log a new clip (same tape, same TC) it will not have the locators. If you mark a source side clip with a locator, it defaults as a timeline locator which can be permanently deleted. Locators generated during capture are clip locators. But if you make a source side timeline locator, then manually move it down to a clip locator, it disapears when you change clips and then reload it. You can use Markercon script to import Media Composer markers (locators). You can't, actually but there is a "jover..."
Put a frame or more of black at the front of the sequence. Put a frame or more of black at the end of the sequence. Select them, plus your the clip you don't want moved. Press S to keep the clips in sync. It's not foolproof but it'll achieve a reasonable level of locking. Another way is to place the clip on its own video (and audio) channel(s) and deselect those channels.